Riding on unfathomable volumes of industrial expertise, we are actively committed towards manufacturing world class Barbed Wire Making Machine. 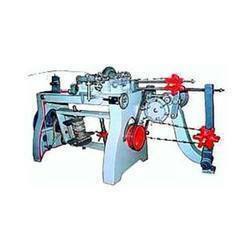 Allied brand Barbed Wire Making Machine.Strand Wire and Point Wire 12/12swg, viz. 2.5-2.8/2.5-2.8 mm Diameter. Tensile Strength: H.B. Fully Hot Dipped Galvanized wire with under 30 kg. F/MM to 55 kg. Width Barb Spacing: 3 to 4" pitch also adjustable with additional gears in winding unit which ever could be supplied only under special demand. Our Major emphasis are laid down upon its adjustability of parts easy maintenance operator has ways approach in setting all arms, cutters making the machine parts fool-proof it ensures easier dismantling, assembling, loading, unloading as well consequent view over flow of formed wire, all the adjustable parts are all together accessible and machine is supplied along with a set of spare twisting sleeve, Take up real, pay off stands, it requires 5 H.P. slow speed 3 H.P. 50C/S squirm ease induction motor with reversible starter whichever is not supplied with the machine it is designed in its heavy structure using closed grain cast iron Se steel in EN-36 series, all the gears are processed by bevel generator Se hobbing machines 15 OH exclusive of Pay-off stands. We “Allied Machinery Corporation” are a Sole Proprietorship Firm and occupied in manufacturing and exporting a remarkable collection of Barbed Wire Making Machine, Nail Making Machine, Nail Polishing Drum, Annealing Furnace, Shoe Tack Machine, etc. When we started our organization in the year 1980, we have developed a wide and well functional infrastructural unit that is situated at Amritsar (Punjab, India) and is look after by our committed and experienced team members. Under the fruitful direction of our mentor “Mr. Jatinder Singh”, we have gained a remarkable position in this industry. We export our products in South Africa, Dubai, Sri Lanka, Nepal.